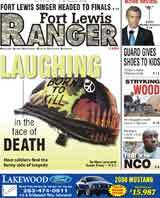 John Simpson, photographer and reporter for the Fort Lewis Ranger is headed back to Iraq in December to capture the stories of the 4th Stryker Brigade during the holiday season. His reports and photos should start appearing here and in the Fort Lewis Ranger newspaper around December 13 through the end of the year. This is Simpson's fourth trip to Iraq since the war began.